Okay. So if I were a novelist writing a book called The King of the Nerds, I might choose ‘Horace’ for the first name of my protagonist. Or, I might go with ‘Dibble’ as my hero’s last name. But there’s no way I’d use ‘Horace’ and ‘Dibble’, as that’d be just too farfetched. We should keep in mind, though, truth is stranger than fiction. We should also remember you can’t judge a book by its cover, no matter how meek that book’s title may be. 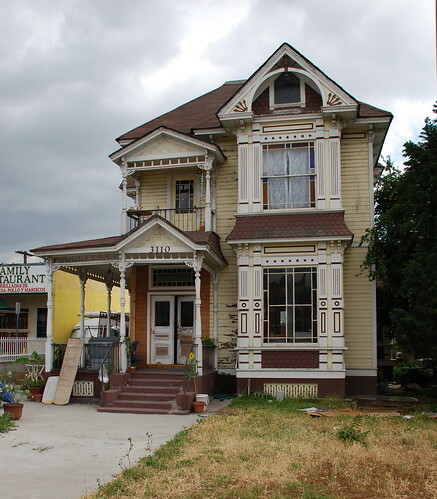 Horace B. Dibble, the salesman whose name is attached to this very old Queen Anne home in Lincoln Heights, stabbed to death a shipping clerk back in the 1890s. 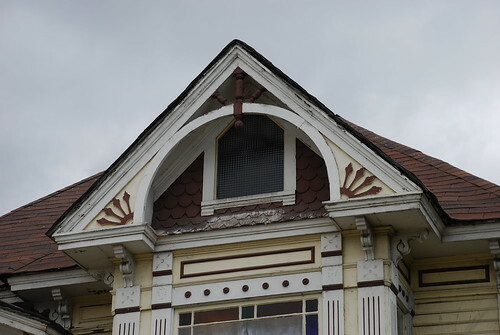 It was during the hour of 7:00 a.m. on June 18, 1896, when Dibble, about forty years old, went to his job at the Pacific Crockery and Tinware Company at 226 North Los Angeles Street downtown where he worked as a salesman. It didn’t take too long before a heated argument broke out between him and a co-worker, shipping clerk James Wallace. The latter, according to the Los Angeles Times account, growled “he had a good mind to jump all over Dibble’s frame because he had given the wrong address for the delivery of a bill of goods.” After being proven wrong, Wallace got so rankled he went to bash Dibble’s brains with a hammer, but thought better of it. Wallace’s last words were, “Dibble has cut me all to pieces.” Around 31-years-old, he left behind a widow and child in Chicago. Dibble, to his credit, promptly replaced the (now blood-covered) knife in its sample case. 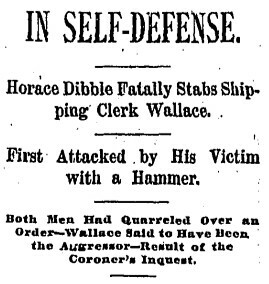 At the inquest later that day, a number of witnesses testified to Dibble’s “jovial and good-natured disposition” and to Wallace’s being “a man of a very quarrelsome disposition and a bully.” Within a few hours, a jury determined the murder of Wallace was a clear-cut case of self-defense, and Dibble was freed on $5,000 bail. Justice was quick in those days. Later that October, Dribble – er, Dibble – was discharged after yet another witness testified to Wallace’s being a notorious hothead. The June L.A. Times account of the murder reported Dibble had lived in Los Angeles for nearly twenty-five years and “is well known and very popular, and lives with his wife at No. 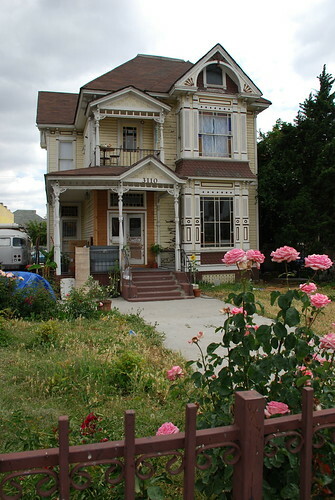 110 Downey avenue [sic].” That section of Broadway was known as Downey until 1910. 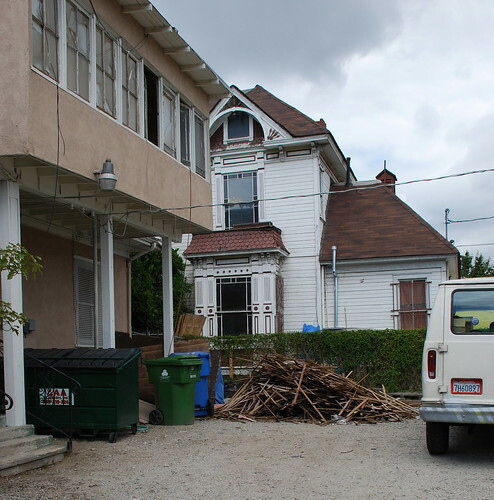 Four years later, George S. Safford sold a lot in block 22, East Los Angeles, to H.B. Dibble for $1,750. What am I trying prove with these transactions? I dunno, except there was an H.B.D., maybe an H.P.D., and if that lot in East Los Angeles was for this monument, that’d push the date of construction at least seven years later than most sources give. 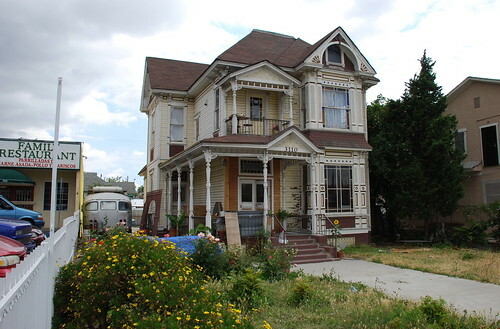 When I was there to take pictures the other week, in the yard was a man who told me he had the place for just a few months and that the home was a single residence. This place is now known as HM157 and is a kind of community arts center, or as they describe it, a "Community Creative Space...dedicated to the propagation of all positive possibilities". I went to a square dance there last night. Their website is here. Thanks for update, Jonathan. Good luck to them.